Everything Go’s rubbish removal will collect waste from homes and businesses in Stockton-on-tees and dispose of it legally and safely. Call or email us using 07971 341453 | 01642 897369 | 0800 4488811 | enquiries@egrubbishremoval.co.uk and we will arrange a time that is suitable for you to come and collect your waste, often the same day for waste collections from Stockton-on-tees . Private and residential properties cleared in Stockton-on-tees for homeowners, landlords or developers prior to sale, after a bereavement or for people who have developed a hoarding problem. We clear homes and properties regardless of condition, in what might be a difficult or distressing time. Private and residential gardens cleared in Stockton-on-tees for homeowners, landlords or developers prior to sale, after a bereavement or for people who have developed a hoarding problem. We clear homes and properties regardless of condition, in what might be a difficult or distressing time. We collect office waste, product packaging and electrical waste from businesses in Stockton-on-tees . We provide a fully licensed waste collection service and can be trusted to dispose of sensitive materials which are subject to data protection. We always dispose or recycle any materials within the guidelines of our industry so if you are implementing ISO 14001 we can help you achieve the standards required. We work with trades to provide cleanup services for builders, plumbers and plasterers in Stockton-on-tees . We free up your time so you can get to your next job by leaving the clearing up to us. We are fully licensed so there is no risk of getting fined for the incorrect disposal of your waste materials. The correct management of waste is important to our environment, personal beliefs and adhering to legislation and good business practice. 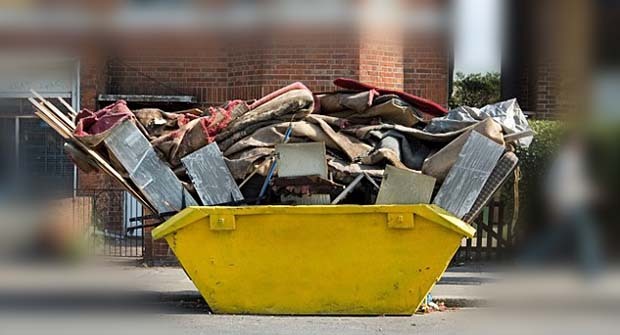 Whether you are a private or business customer in Stockton-on-tees , EG Rubbish removal always dispose of your waste within the guidelines outlined for the communities of Stockton-on-tees . Recycling is always our preferred method of disposing of waste in Stockton-on-tees . For businesses looking to achieve ISO 14001, we can provide all the paperwork to help you achieve these standards.